Tips on the lighting concept are in demand because it is both a design element and an inspiration. For those who prefer a classic style in their living room furniture, vintage flair combines classic flair with cosiness. Happy hints are flat chandeliers on the ceiling. However, as their light often does not cover the entire room, a combination with floor lamps or wall lamps in dark corners of the room is recommended. Straight LED spotlights are a stylish ceiling lighting in modern and minimalist living rooms. They stage murals and couch corners give them, if not too dense, a cozy atmosphere. But beware: the LED light enhances colors. For cold and dark walls, a small room looks even smaller, colder and darker. Another possibility to support modern flair are evenly distributed hanging lamps in geometric shapes. In a country-style living room, ceiling lamps should not be installed in straight or geometric - this is a style break. Here better rustic or playful forms are used. One of the best tips for country house rooms with little light is a floor lamp made of natural materials. Umbrella lights for the living room are available in colorful retro colors. In order to emphasize the retro style of a room even more intensively, colored ceiling lighting and light staging come into question. A highlight of certain retro items can be made with colored LED spots on the ceiling. 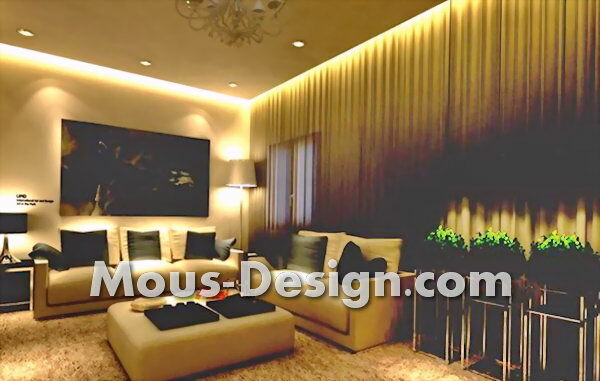 So that living rooms do not look cold and boring, the use of several ceiling lights is well. An interesting shadow play ensure LED strips over important room areas, which are provided at the ends with larger screen lamps. The correct lighting planning enlarges small rooms. In the living room, mounted mirrors in combination with LED ceiling spots can provide more play of light. In this way, brightness floods the entire room. This enhances small and dark rooms. Ceiling lights often do not suffice for sufficient brightness in the living room. In rooms with small or few windows, a ceiling light may create a basic lighting mood, reading light does not create it. Even very large rooms need to be lit several times. This can be realized by lighting sets. Rooms with many windows are blessed with light. Too much light can make rooms feel uncomfortable, hard and cool. Therefore, the ceiling lighting should be "warming" and "soft". Indirect lighting with warm-colored screen lamps best fulfills this requirement with dim and round light cones. The Energy Saving Ordinance has left its mark on the lighting industry. Energy-saving lamps have replaced the light bulb, which is a challenge for consumers. Because the old Watts designations are history. For the ceiling lights in the living room 11-watt or 20-watt energy-saving lamps are used. Lamps with the description "warm-white" are ideal for a cozy living room atmosphere. Ceiling lamp offset: what does it cost? These and many other questions we answer in the price radar around the theme ceiling lamp.